Facebook becoming a major competitor for Google, becomes Most-Visited Site. Although the “thud” wasn’t verified, it seems that an online giant fell a couple of days ago. According to new data from Hitwise, Facebook managed to beat Google in terms of visits between March 7th and March 13th, becoming the most visited website in the U.S. for the week. The graph visible below makes the changeup pretty clear, What’s more, it doesn’t look like Facebook’s going to relinquish its lead anytime soon. Facebook reached an important milestone for the week ending March 13, 2010 and surpassed Google in the US to become the most visited website for the week. Facebook.com recently reached the #1 ranking on Christmas Eve, Christmas Day, and New Year’s Day as well as the weekend of March 6th and 7th. 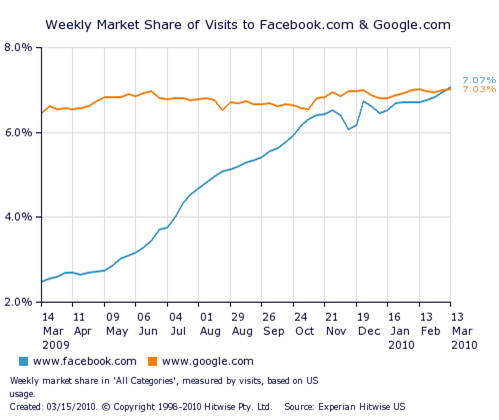 The market share of visits to Facebook.com increased 185% last week as compared to the same week in 2009, while visits to Google.com increased 9% during the same time frame. 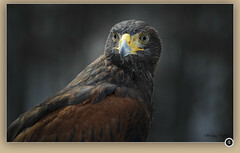 Together Facebook.com and Google.com accounted for 14% of all US Internet visits last week.